A parliamentary report of 1777 recorded a parish workhouse in operation at Coleshill for up to 44 inmates. Meriden, together with several other parishes, formed a union under Gilbert's Act of 1782. Amongst other things, uhe Union had the power to operate a joint workhouse and one was erected in 1793 at a site on Maxstoke Lane in Meriden. County of Warwick: Allesley (2), Berkswell (2), Church Beckenhill [Bickenhill] (2), Coleshill (2), Corley, Coundon, Fillongley (2), Hampton in Arden, Kinwalsey, Lea Marston, Maxstoke, Meriden (2), Great Packington, Little Packington, Sheldon, Shustoke, Nether Whitacre, Over Whitacre. Later Additions (from 1911): Castle Bromwich, Curdworth, Minworth, Sutton Coldfield, Water Orton, Wishaw. The population falling within the union at the 1831 census had been 10,481 with parishes ranging in size from Kinwalsey (population 19) to Coleshill (1,853). The average annual poor-rate expenditure for the period 1833-35 had been £5,651 or 10s.9d. per head of the population. In 1836, the Meriden Union workhouse took over the existing parish workhouse building. The Poor Law Commissioners authorised an expenditure of £1,260 for it be altered and enlarged. The site location and layout are shown on the 1904 map below. The entrance block at the south contained a lobby, Guardians' board room, and kitchen. Females were accommodated in the wing at the west where a chapel was also located. Males were accommodated in the eastern part of the building which also contained casual wards. Inmates' yards were places at the west of the female wing and at the north of the male wing. An infectious ward was in a separate building to the north of the entrance block. A fever hospital was later erected some distance to the north of the workhouse. Meriden workhouse entrance from the south, c.1905. 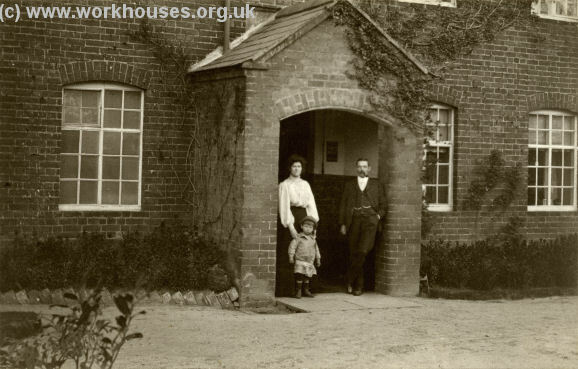 From 1904, to protect them from disadvantage in later life, the birth certificates for those born in the workhouse gave its address just as 1 Maxstoke Lane, Meriden. After 1930, the former workhouse became a Public Assistance Institution, and later a "County Welfare Institution". After 1948 it was renamed "The Firs" Old People's Home and Hospital. The workhouse buildings have now been demolished and new residential accommodation has been erected on the site. The Meriden Union established a children's home on Leys Lane, Meriden. In 1924, it could accommodate 11 children, with J.J. Edgington as its Superintendent. Warwickshire County Record Office, Priory Park, Cape Road, Warwick CV34 4JS. Holdings include: Guardians' minute books (1841-1929); Accounts (1845-61, 1873-1930).